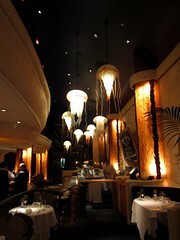 I met volenti for dinner back in November 2010 during one of my business trips to San Francisco. Yeah, this post is old. 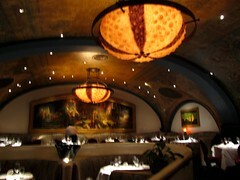 But, in my defense, Farallon is no new kid on the block. It has been serving high-quality seafood in Union Square for 15 years, so this post is only confirming what everybody already knows. volenti suggested Farallon. She's a pescatarian. My hotel was a few feet away. 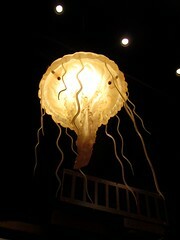 It was perfect, even if I was initially wary upon seeing the ridiculous, over-the-top, under-the-sea decor. 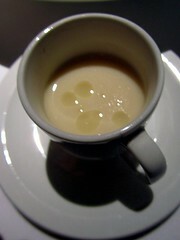 Cauliflower soup with truffle oil. Mmm. 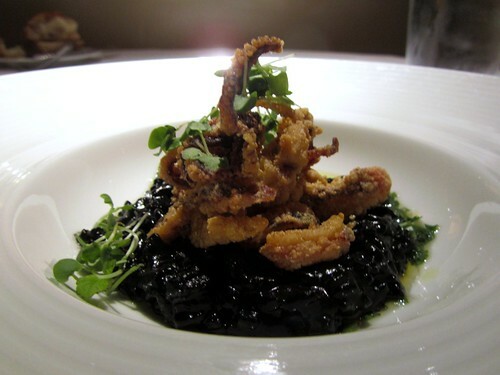 Cornmeal fried local calamari, squid ink risotto, micro beet tops, sauce ravigote ($10). 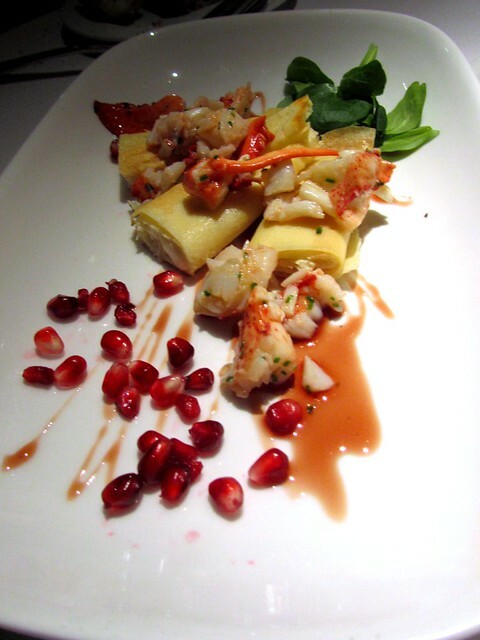 Caramelized shallot and creme fraiche stuffed crepes, Maine lobsters, lambs lettuce, pomegranate gastrique ($13). 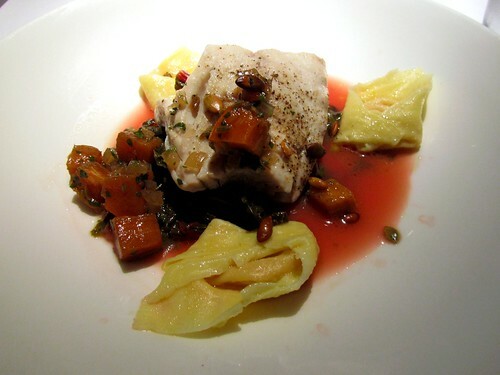 Steamed Maryland striped bass, butternut squash tortellini, braised red chard, toasted pumpkin seeds ($27). 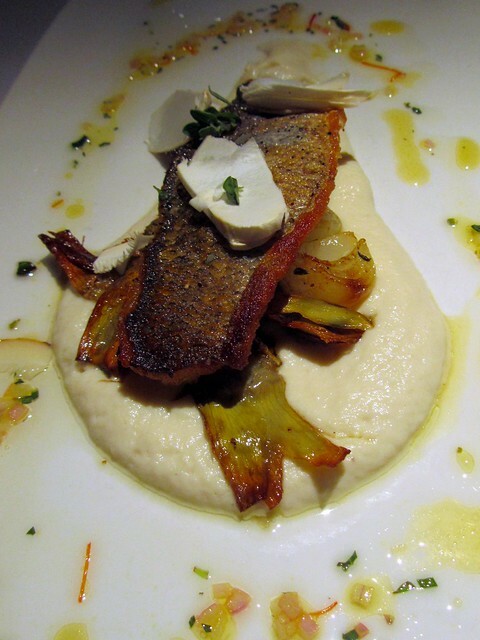 Pan roasted Mediterranean branzino, celery root puree, roasted cippollini and baby artichokes, white wine-saffron vinaigrette ($29). 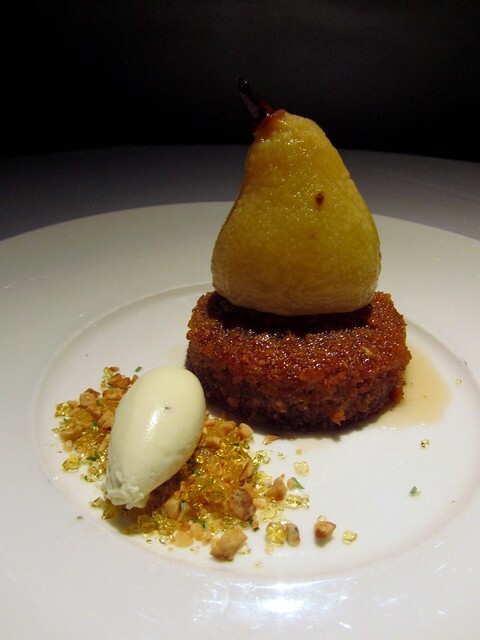 Honey-roasted pear, hazelnut brown butter cake, Douglas Fir mascarpone, Hangar One Fraser River raspberry syrup ($10). 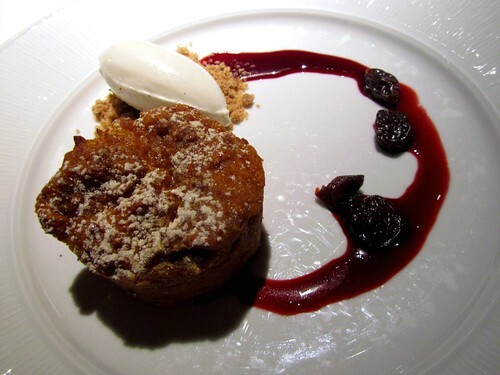 Pumpkin spice bread pudding, sour cherry vincotto, vanilla bean cream, sugar and spice streusel ($10). 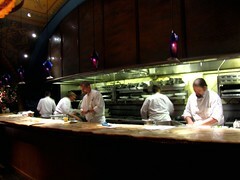 Farallon may not be the newest, hottest place in San Francisco. Far from it. However, you will have an excellent meal there that is worth every penny. i need that squid ink risotto. seafood loving bear and i must go next time we're up north.